I woke up this morning thinking about how difficult it is to live up to people’s expectations. 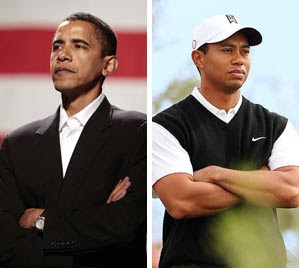 It was sparked by all this talk about Tiger Woods cheating on his wife and President Obama getting the Nobel Peace Prize right after signing off on sending 30,000 troops to war. I started wondering how these guys must be feeling right now. Being an expert in disappointing people, I wondered if they had their own disappointment tool kit to help them through tough times and tough decisions. I remember when I first started disappointing people. It was September 27, 1975–the day after I was born. The first day didn’t count because my parents were still in shock, so I had mercy on them. But after that one day of reprieve I got to work. I cried when they didn’t expect it. Pooped at inconvenient times. And once I started talking I said things they didn’t want to hear like, “no”. From my relationship with them, I honed my disappointment skills and now have disappointed on a global scale. As I’ve traveled the world, I’ve left in my wake disappointed wives, girlfriends, friends, teachers, bosses, preachers, kids, animals, car dealers,in-laws. You name it. If they met me, I disappointed them in some way. People want you to live up to THEIR expectations and when you don’t they get disappointed. I’m pretty sharp huh? Guess what else. even if you don’t know what their expectations are, most of them will still feel victimized and hold your unknowing against you. It doesn’t even matter if you ask them and they tell you one thing and expect another. If you don’t read between the lines right, it will still be your fault and they will blame you. Knowing this, I decided to just accept it. Disappointing people is the easiest job in town. It really doesn’t take much. Here’s a little imagery to illustrate my point. Let’s say you go to the beach. You’re just about to jump in the water when somewhere down the way you see someone take a leak in the water. Will you jump in? Probably not. That whole vast ocean, which is a toilet for aquatic creatures by the way, is ruined by one cup of urine. That’s how humans think. It doesn’t matter how much “good” you do in this world, most people are going to focus on the things you do to make them uncomfortable. Why? It is all because of fear. I know it took me a long time to get to that point, but I think it was called for, because I’m trying ot make the point that ALL EXPECTATIONS COME FROM FEAR. If that is hard to swallow, I can explain it to you in more detail. But I’m going to start charging money for phone calls soon so you better get on it. Anyway, because most humans are scared of everything in the world, we set expectations to help us manage our fear of loss. If most of us didn’t have expectations to encourage us to move forward we’d probably be paralyzed by our fear. You know I’m telling the truth. In fact, the truth is the chief disappointer. Ninety percent of the people I’ve disappointed in life has been because I told them a truth they didn’t want to hear. As you readers know by know, I am all about TRUE L-O-V-E. I’m talking about the pure eternal God stuff. I ain’t talking about that watered down version you can get off the streets. I’m talking the real deal. I’d rather have an ounce of that than a ton of the fakey fake. I’d choose a half a second with the REAL than a gazillion years with the imitation. But the only way to touch the hem of TRUTH’s garment is to be willing to live beyond expectations. And trust me, doing that will always disappoint the fearful. So be patient if you make that choice. That’s the lesson I’m learning. You will disappoint, but try to do so with compassion. To my heart this scripture says, “meet people where they are and love them, but you don’t owe them anything more than that.” There’s power in this for me and anyone else who can receive it. But unless you willing drop your fear and consequently the expectations you create to protect yourself, you can’t drink from this cup of awareness. I’ve choked on this a few times myself. I know how difficult it is to just walk into the world and take your chances. And I know what it’s like to carry the burdens of family, neighborhood, city, culture, history and everything else with you as you try to live a life of purpose. But God has offered us the opportunity to cast all our cares upon him (see 1 Peter 5). We can be light again and live beyond expectations. But greater than that we can allow others to do the same. When we judge others for not living up to our expectations, we set the stage for great injustice. I know when I was younger I used to think that it was crazy that certain people like entertainers, sports figures, lawyers, and some preachers made so much money in this world. But as I matured, I came to realize that in some ways we pay these people to bear our expectations. When I see people crying about “their quarterback” losing the game or when they get disappointed in Tiger for hooking up because they “thought he was better than that” I can’t help but laugh. Of course I do it sometimes too. And every time I do it, I laugh at myself. I wish Tiger didn’t get busted and as a vet I wish that Pres O’ didn’t have to agree to send over 30,000 more troops, but I’m not those dudes. I don’t feel their feelings or their brand of loneliness. So instead of weighing them down with one more person’s expectations, I pray for them. I do so not because I think that their choices were wrong. That’s God’s business, not mine. I pray for them and with them because we all deserve to be Light. We all have disappointed others. We know it’s not always because of our intentions or even our actions. Sometimes it’s because of the pressure of disproportionate expectations that we couldn’t shake off. But while some people may not have mercy on us, God is all mercy. When we release people from our expectations, we are more like our Father in heaven. That in itself is a gift to everyone that we all can afford to give.